Once again I have to state that I'm a big fan of how enterprise-class computers are built, specifically in regards to internal layout. Because these machines are designed to be easily serviced should the need arise, there are really quite a lot of intelligent ideas that go into how they're built that make me wonder why we don't see them more often on the consumer side. 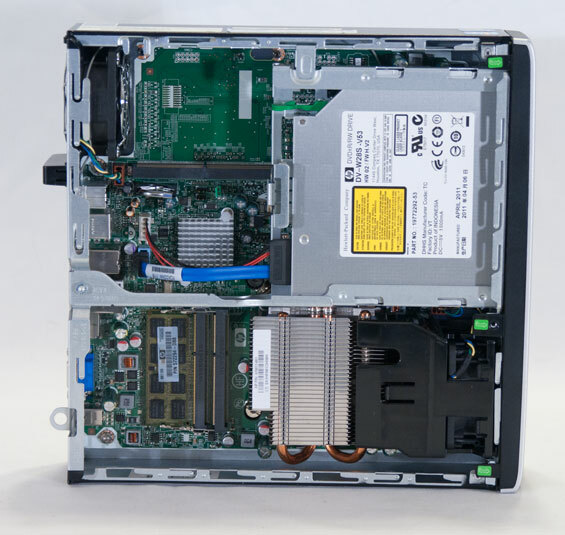 Take a look inside the wonderfully small HP Compaq 8200 Elite Ultra-Slim. Everything is in its right place and extremely easy to service. 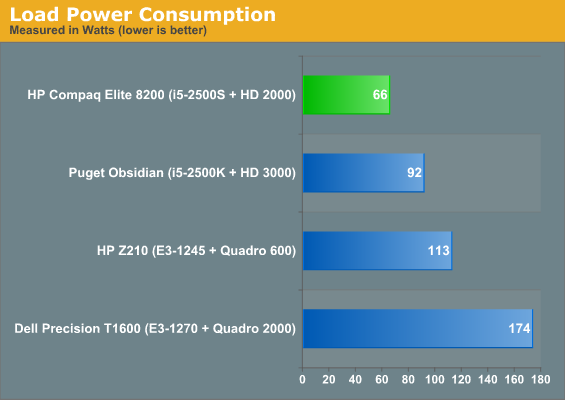 Due to the smaller form factor, HP opts for mainly notebook parts inside the 8200 outside of the 65-watt processor. There's a substantial heatsink complete with copper heatpipes covering the processor, and a fan from the front channels air straight through it and out of the back of the case, cooling the memory in the process. When I opened the 8200 the first time I was surprised to see the relatively large empty space in the top left corner; that MXM slot is actually there in case the system is custom ordered with a graphics upgrade, which can be cooled by the second small fan. The catch as noted earlier is that the only graphics upgrade available is an AMD Radeon HD 5450. Given the nature of this desktop, we can't say that upgrade is really worth it. Considering the low power components of the 8200, it should come as no surprise that the system runs quietly and stays reasonably cool. The CPU temperatures aren't stellar (though they're still better than most notebooks we test), but this is also a very small enclosure, and HP has largely erred on the side of silence rather than performance. Since Sandy Bridge is already a cool-running architecture to begin with, this winds up being the right trade. Air circulation within the chassis also seems to be good enough to keep the 2.5" Western Digital Scorpio Black running cool. 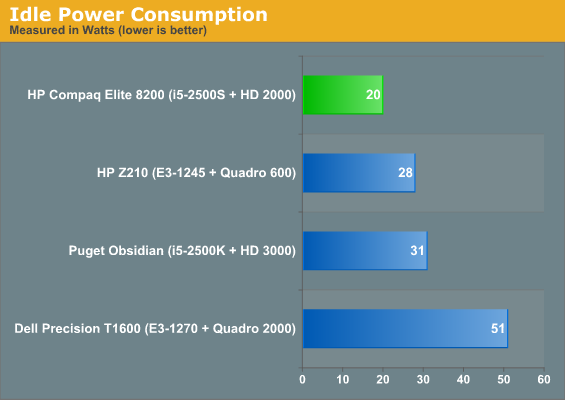 Other than pure size, power consumption winds up being the 8200's trump card. With load power of just 66 watts, it's not hard to see why a business might want to deploy several of these for users who don't need extremely high-powered hardware. 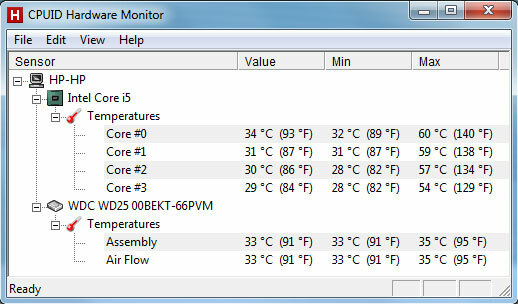 Idling at the desktop, it consumes a miserly 20 watts. While it's not strictly required by the DisplayPort standard, I'd bet you a nickel that HP's implementation of DisplayPort includes the "DVI compatibility" dual-mode that'll let you use a <$10 cable adapter to connect from DisplayPort to a DVI (or HDMI, for that matter) monitor. i just wish manufacturers would hurry the hell up with it, i mean was it too much to ask all these years for a simple digital connector that carried sound? DP cables aren't screwed, but they have tangs that lock the cable at least as securely in place (until you press the button on the connector). Certainly the DP->DVI adapters in use at my workplace have those, and the DVI cable can screw into the adapter. Not that detailed about the sound emission in the review.